In “Upcycling Part I,” we looked at the origin of the word “upcycling” and sort of the basic trash-to-treasure concept (if you missed it and have no idea what I’m talking about, you can find it here, but we didn’t get to really see it in action. It was all very informative and blah blah blah blah… ok we get the point. Now it’s time to put my Pinterest where my mouth is. This is the fun part where I get to prove that upcycling is something you can incorporate into your lifestyle on any budget, any scale, and regardless of your personal stylistic preferences. 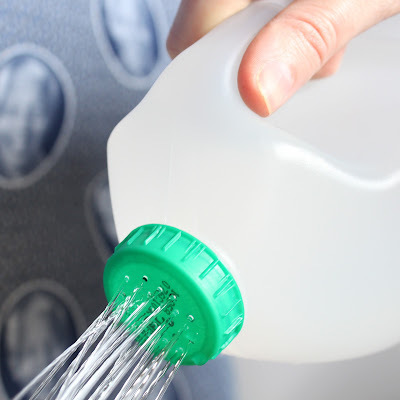 Make a watering can out of an empty plastic milk jug! 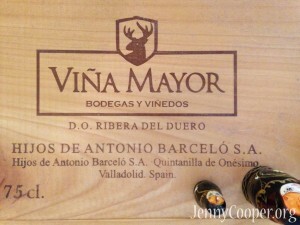 It’s infinitely cheaper than buying a water can (costs $0!) and takes about 1 minute to make. Also, if you’re interested in Universal Design, it’s a lot easier to hold and pour than a big, clumsy watering can for those who have difficulty using their hands or lifting heavy objects. 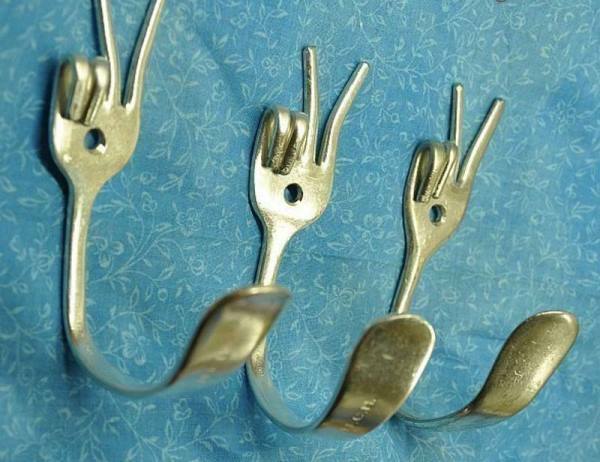 Make rockin’ wall hooks out of old, mismatched or garbage-disposal-mangled silverware. 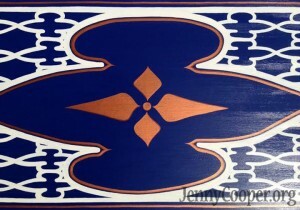 This and many other styles and versions of this idea at Interiorholic. 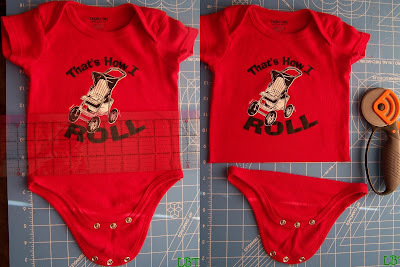 For anyone who has or knows a baby, keep baby clothes useful a little longer by turning onesies into tiny t-shirts! All it takes is a pair of scissors (ok, and some basic sewing skills if you want to get fancy about it). Little Buggie Tutu actually turns hers into a dress, but I could see a t-shirt as an easier – and gender-neutral – option for the less crafty among us. Medium scale: My efforts to revive junky furniture and furniture that used to BE junk. 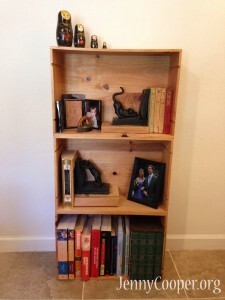 This bookcase, which I made way back in 2010, is made of wine crates that my neighbor was going to throw out. The whole thing took half an hour, and that’s only because I had no idea what I was doing. 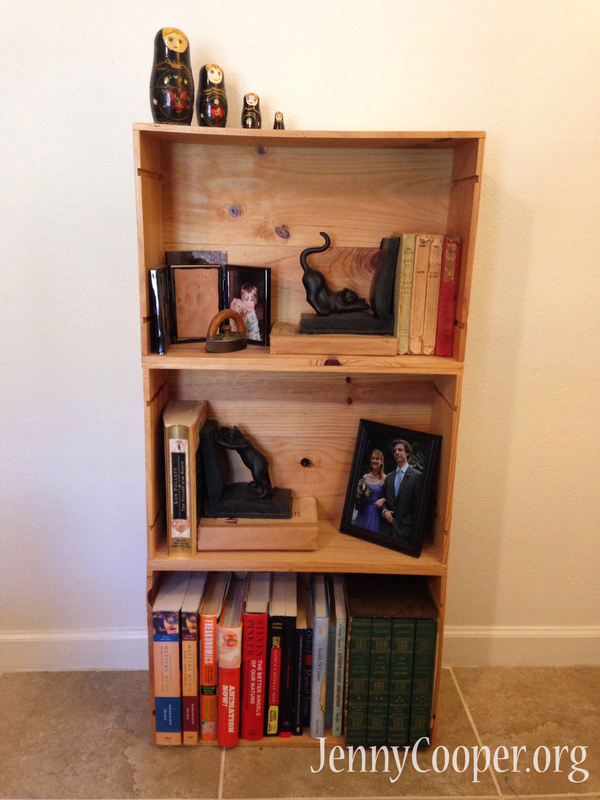 I literally glued three wooden crates on top of one another, reinforced with a few nails and –voila!I – just add books. 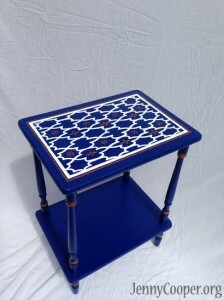 This set of tables is a much more recent (and perhaps more advanced) project. I picked up two non-matching tables on craigslist about a month ago, sanded, primed and painted them to create a fabulous matching set. 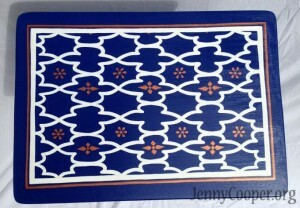 DISCLAIMER: There is some controversy about whether repainting old furniture should really qualify as upcycling. After all, taking a dresser and turning it into a slightly better-looking dresser is hardly a re-purposing innovation when you could have just given/sold it to someone who would be happy with it as-is. Not to mention, some critique furniture “flippers” (just like house flippers) for taking perfectly good, low-cost items off the market for people who can’t afford the pricier, “flipped” versions. That said, I believe it still counts as “upcycling” if it meets the requirement of adding or improving functionality. 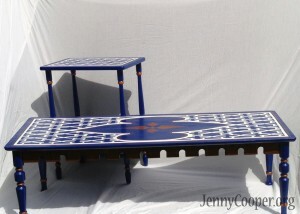 My flimsy excuse is that I turned two mismatched, cosmetically-challenged Craiglist tables into a matching set, but there are also many much more exciting examples out there. For instance, you could make an awesome bench/window seat out of discarded kitchen cabinets. I love projects where I get to use my creativity in a way that is good for the planet. “Upcycling” or repurposing “junk” is just one way to get people to view their “stuff” in a new light. 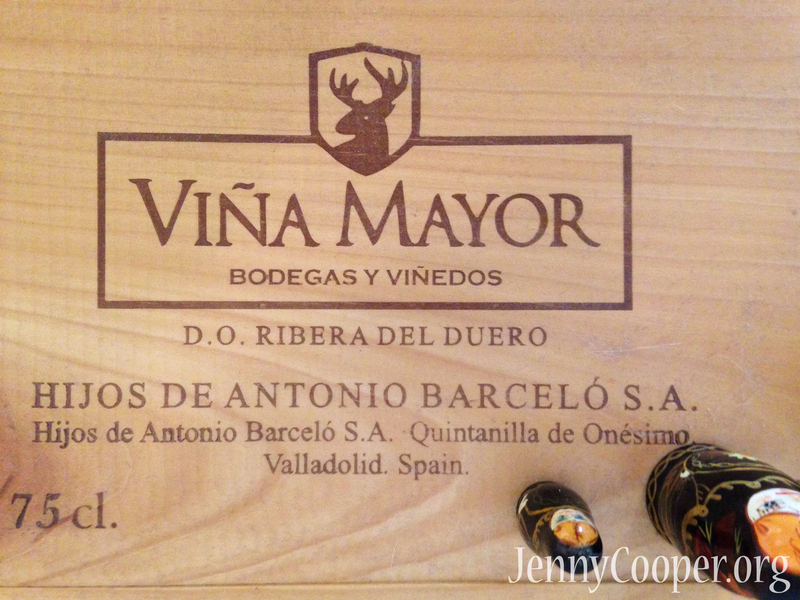 How do you merge your artsy side with your eco-passion? I would love to see examples of what other people are working on. Stay tuned for the final part in this series: Upcycle XXL – architecture projects that upcycle on large – and VERY large – scales.